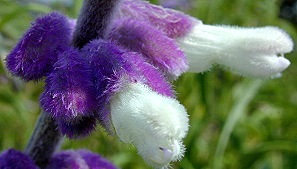 These soft fuzzy flowers top one of the most ornamental of all Salvias. A sturdy grower with good form, Mexican Bush Sage not only stands out in the garden, but attracts lovely hummingbirds as well. The Mexican Bush Sage to the right is only two years old and is already about four feet wide. It will bloom from mid to late summer until frost when it will die back to the ground. In warmer climates, it may stay evergreen. In this situation, cutting it back to the ground once a year in the fall is recommended. This plant is sometimes available in plug trays. These trays hold 128 of all the same plant. They are a great low cost way to fill a lot of space. Each cell is 3/4 of inch by an inch. 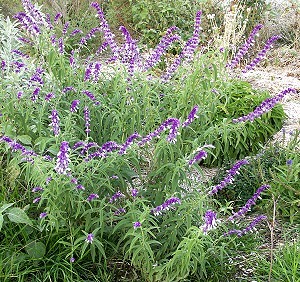 Check here to see if Mexican Bush Sage Plug Trays are available.